Currently I am recovering from a heatwave that seemed be going on forever. Unfortunately for me I am not very good at dealing with high temperatures. I fare well with low temperatures and feel very sorry for myself during large parts of summer. Right now I feel like I am yet not human. The right attitude for an album by that name! 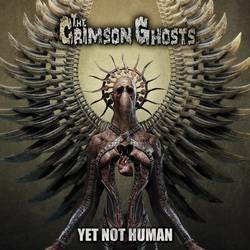 After four albums and two split records The Crimson Ghosts unleash their fifth full album upon an unsuspecting mankind: Yet Not Human. Although, unsuspecting? This album was announced ages ago. After a while Facebook messages from the band started sounding a bit frustrated as the band had some trouble finding a new drummer. Now that they’ve found one, the big question is: did this influence their sound? For now, I’d say: no. It seems The Crimson Ghosts have found a drummer who can drum in the same vein as his predecessor. If he has any influence on the writing process we cannot tell yet. This record was written before Old Nick joined the band. I realise I am a bit late, but nonetheless I feel I should warn you: I am a bit of horrorpunk fan. And as such, I am a bit of a The Crimson Ghosts fan. In my mind, they are ready to take over the crown of The Misfits, together with The Other and Calabrese. In other words, this is the crème de la crème of horrorpunk. From day one The Crimson Ghosts took that sweet sound The Misfits developed with Michale Graves on American Psycho and Famous Monsters, but dialed up the metal influences a bit just as The Other does. There is big difference between the two bands though. Where The Other are now bordering on power metal territory, The Crimson Ghosts are undeniably horrorpunk. They just adopted a much heavier, metal-style production and their drumming is more metal than punk. Yet Not Human fits right in the bands catalogue so far. There’s lots of fast songs, there’s the obligatory wohoho sing-a-long parts. Everything’s there, except for one thing: a proper ballad. Instead of a ballad The Crimson Ghosts offer us a dark, doomy track. And that is a bit disappointing to me. I loved the ballads this band wrote. So a proper ballad is dearly missed. And the doomy “Ego Sum Qui Intus Habitat” is in my opinion the weakest track on the album. It does what is has to do: offer a bit of variety, but it’s just not a very strong song. What is strong on this album are the vocals. Where on other albums Vlad uses his gruff vocals (which are really strong, but don’t always fit very well), they are almost completely absent on Yet Not Human, making this album very melodic. And I like my horrorpunk very melodic, so I consider that a good thing. All in all, this is a very strong album. Not their best, that title still goes to Dead Eyes Can See, but this new album comes very close! Posted Sept. 3, 2018, 10:46 p.m.